At 4:18 AM this morning, the National Weather Service continued to hold their forecast at Gage Elevation 56.0’ in Richmond. This is approximately 17 inches higher than what we saw last May in Richmond. 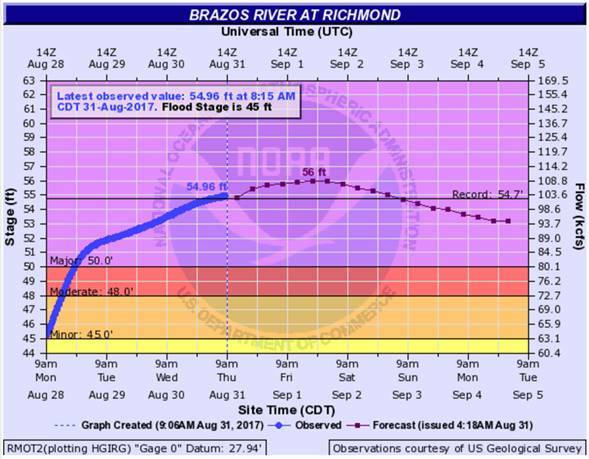 As of this morning, the Brazos River water level outside of the District has reached the same level as we oberved at the District last year. Last night we shut down the District’s main pumps as the internal lake elevations reached our minimum pump level. At that time, the District received our portable pump that we will use to pump additional water out of the lakes. Based on the forecast, we will continue our levee inspections through Tuesday.